This weekend the London Boat show is in full swing - we went over to have a look and the latest in luxury launches. With over 300 high end brands, from world-class yacht companies, jewellery, fashion and travel operators, there was an overwhelming selection - even the boats ranged from small fishing dinghies to exclusive super yachts. Click on any image to enlarge. We started out small and decided to begin with Honda's exhibition of small, high end fishing boats. Honda's reputation for their well-built, powerful engines is well recognised within the boating industry. Our next stop was the Princess Motor Yacht exhibition. The Princess brand is one of the oldest and well respected yacht brands, mainly bought by private investors for charter, allowing them to earn back some revenue on their significant investment. Project 31 (also known as Charlotte) is the oldest boat built by Princess was one of the smallest but most beautiful. The 50 year old boat has been remodelled to unveil a contemporary yet retro vibe to celebrate the company's 50th year last year. 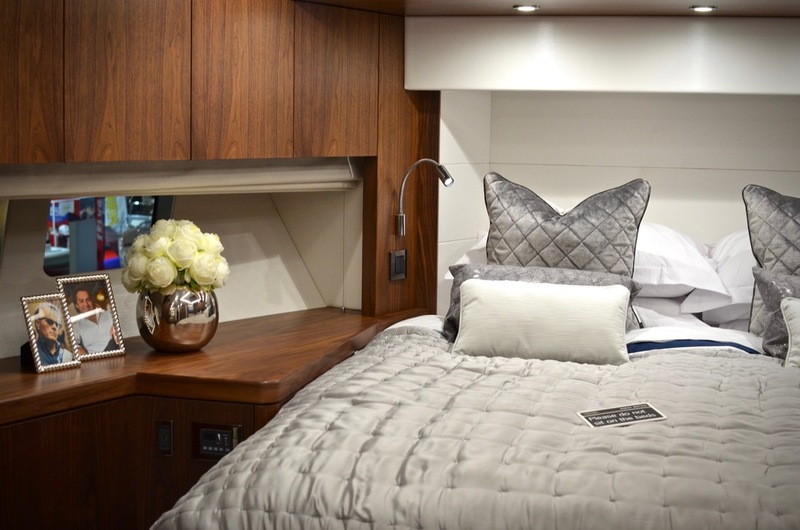 The Princess 75 Motor Yacht is one of Princess's newest and most luxurious models. The glamorous £3m yacht boasts enormous windows - a current trend amongst super yachts (the more glass, the better). The deck layout includes a walkthrough foredeck with U-shaped seating and sunbathing area - designed for socialising - and a private walkthrough to the mater cabin suite. Out next visit was towards the luxury yacht brand, Sunseeker - my personal favourite. Attention to detail is apparent with Sunseeker in all aspects from the craftsmanship to their luxury speciality service, provided for all those purchasing a yacht (which retail from £700,000-£24m) from a full crew down to necessities such as insurance and licensing, making the customer feel at ease. We were then escorted down to an exclusive area of the Sunseekers exhibit - a selection of miniature, hand-made models of Sunseekers yachts, a Boodles luxury jewellery counter and a complimentary champagne bar (always a good move). The Sunseeker 75 was our next stop and oozed sophistication. 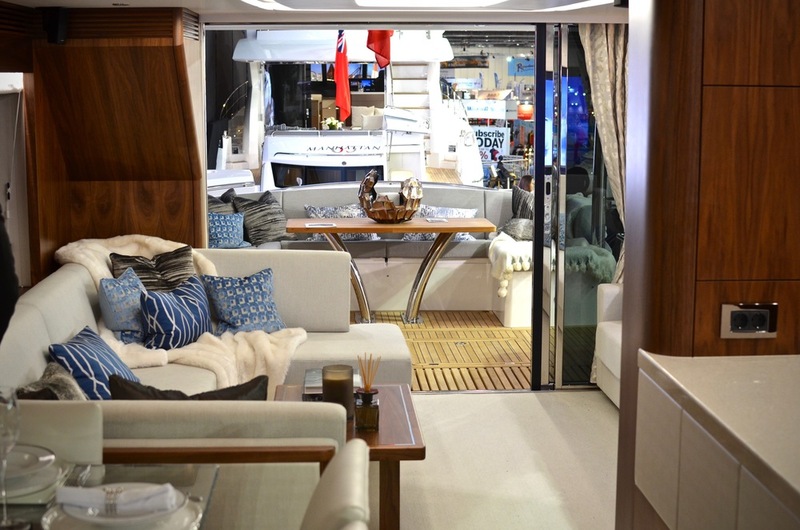 Inside, the four cabined yacht is able to accommodate up to eight guests who, when outside can relax and socialise in the wetbar, dining area and sunpads for luxurious sun lounging. Other exhibits can be seen in the album below. Click on each photo to enlarge, and more information about the show can be found here.